The new MC3000 DJ controller from Denon DJ is an affordable professional MIDI controller for Native Instruments® TRAKTOR™ 2 Technology, complete with TRAKTOR™ LE 2 included, which is also fully optimised for Virtual DJ. 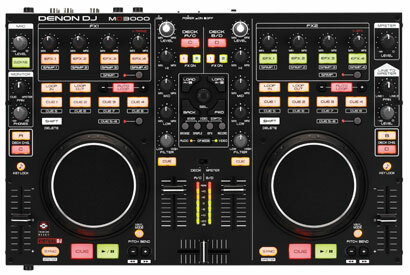 Following on from the sucess of Denon's larger MC6000 controller, the MC3000 is equipped with 4 Deck control and a high quality internal soundcard. 105mm touch-sensitive jog wheels and smooth 100mm pitch sliders (140-bit resolution) give DJs exacting control of their software of choice. Meanwhile the Line to Master feature allows two analogue line inputs (from CD Players etc.) to be connected alongside a Mac® or Windows PC – ideal for DJs looking to transition from tradional CD mixing to digital playback. The Layer Function for Dual Deck and 2+2 (4-channel) mixer control retains functionality whilst maintaining an un-cluttered and ergonomic layout. The design has also been optimised for use of the new sample deck and loop recorder function in TRAKTOR™ 2 making it easy to hit SAMPLE and switch the EFX panel to a dedicated sample section with independent volume and filter controls for each. File browse navigation keys, rotary encoder file selector knob and 8 (4+4) hot cue buttons with layer bank selector key means the MC3000 is a fully operational controller for the latest software. The powerful shift key for various dual button operation, large size Cue and Play buttons, and the inclusion of Denon “Legacy” Pitch bend keys give truly professional features at your fingertips, minus the hassle.